For 2+ years, we have been following the development and eventual launch of Mosko Moto products via their thread on ADVRIDER. The unique approach to "crowd design" the products, and the ADV orientation of the founders resulted in strong products from the beginning. However, they were pricey soft luggage and it was tough to justify when we had perfectly good hard panniers. Then the machine was sold with the luggage, and there was a conscious decision to evaluate all of the luggage options out there. There is a dizzying array. Usable when travelling 2-Up. This knocked out a number of otherwise good options which used the passenger seat or rear leg/peg space. Waterproof. This lead to the sale of the Wolfman Monarchs and eliminated a few other options. Cost effective to use on more than one bike. This eliminated anything with expensive mounting solutions. Able to be secured for a short time away from the bike. Eg: lunch stop in town. Portable. How easy is it to carry them 100 meters, or up a flight of stairs to a room? This is related to security. Capacity for a multi-week trip. This eliminated some dirt bike solutions. Reasonable cost. This eliminated solutions costing more than a used KLR. Easy on/off. This is subjective of course, but also related to security. The end result was the Mosko Scout panniers. They checked all of the boxes, except for security. After speaking with Pete from Mosko at a show, he convinced us that a cable lock solution would be a good compromise. He also mentioned that a locking clasp was in the works and might be retrofitted to the Scouts. Metal panniers had advantages besides security, including capacity, campfire stools, etc, and there were comparably priced solutions. In the end, it was not an easy choice. Soft luggage proponents touted avoiding injury in falls, lighter weight, airport carry-ones, etc. Hard luggage proponents touted security, repair ability, and proven around-the-world cred. The Moskos represented a good compromise. The deciding factors were the molle system for expanding capacity, and the ease of mounting on any machine with a rack. The removable inner bag was also a plus. Usage so far has proven this to be a good choice. Only a few thousand miles (2786 to be exact), but they are certainly waterproof (in fact air tight), rugged, and easy on/off. 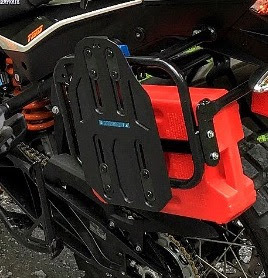 they have been caked with muddy water, they have been on their side bearing the full weight of the BMW Sertao off road, and they have withstood general road grime. After all of this, a good rinsing with a hose has them looking almost as good as new. The carry handle works surprisingly well for transporting the bags off the bike. A molle fuel bottle and an additional general storage pouch have been added, proving how useful the expandable capability of these bags can be. Are they perfect? No, but the list of shortcomings is short. First, you have to be careful what you just throw into the bags. Sharp objects have the potential to damage the inner bag. They are thick, so it would take some doing, but it could happen. Second, it would've been nice to have some greater fore/aft or height adjustment with respect to mounting. The pucks dictate the angle relative to any rack and the height. Lastly, they are ridiculously easy to remove, which is both a plus, and a security concern if someone knows these bags. A lock or security system is certainly needed. That's it, on balance the benefits are many, and the challenges are few. The evidence of good design and a high standard of quality abounds on this luggage, and we expect them to hold up well over time.